Me (on the left) with my eventual supervisor, Zo-Ee. Hi there, I’m Brian Tan, a 4th year student from Manila here in the Philippines. It’s been 4 days of me working as a UI/UX apprentice for Stampede, and it still feels surreal. How did a young student like me get to intern remotely for an awesome foreign company like Stampede? Let me tell you about the crazy story of how I got this internship. It all started when I was randomly searching for design conferences online. I had never been to a big design conference abroad yet, so I just went searching on Google. 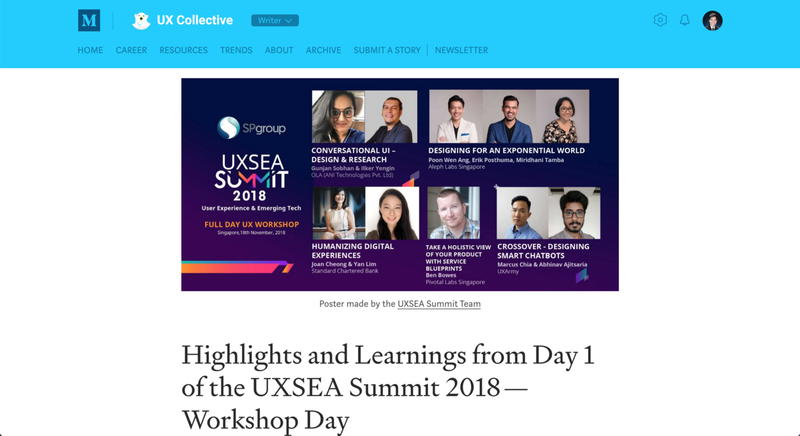 I eventually found the website to the UXSEA Summit, a 3-day design conference in Singapore held in November 2018. I got excited. I wanted to see if I could land a UI/UX design job in Singapore to work in after I graduate, mainly because of the higher pay and better quality of life. The design and tech industry is also much more mature there than in Manila. I saw too that the price of the conference was quite affordable compared to other international design conferences. But I thought to myself — what if they’re willing to give a discount to students? So I went ahead and messaged the UXSEA Summit Facebook page, asking if I could be given a student discount. To my surprise, the organizers were willing to give me a 50% discount. It gave me even more reason to go, and I told my parents about it. They were supportive of me going, with my mom offering to pay for the flight ticket using her miles. I also asked my cousin, who works in Singapore, if I could stay over at her place in the few days I’d be there, and she said I could. Amazing, I thought. I had my flights and accommodation covered, and I got a huge discount for the conference! I didn’t care anymore about the fact that I had to miss a couple days of classes. I knew this conference could be the key to networking my way into a job there after I graduate. Fast forward to after flying from Manila to Singapore, I arrived at the first day of the conference a few minutes late. Most of the seats had been filled up already, but I found a vacant seat next to a table in front. I sat down on that seat, and little did I know that I’d be sitting next to my future supervisor for my internship. Beside me was Zo-Ee Chee, UX Strategist at Stampede. Me with Zo-Ee and my fellow Filipino tablemates. She told me about how Stampede was a Malaysian UX design and software agency, and how their founder brought their whole design team there. I ended up spending the rest of the day talking to Zo-Ee and my tablemates, who were also from Manila surprisingly, and doing the hands-on workshops. Zo-Ee and I even designed a wallet for each other as part of the Design-A-Wallet workshop there, and we got to know each other more through the stories and ideas related to what we wanted in a wallet. I had a lot of fun getting to know Zo-Ee and my tablemates, and Zo-Ee introduced me to Shaza Hakim, the founder of Stampede. I had no idea that I would be interning for her, and I wasn’t even searching for an internship at the time. I have classes this semester, and I was unsure if I wanted to juggle that with an internship. I didn’t even know that interning remotely for a foreign company was an option. I was just curious about their team, and I asked Shaza a few questions. After each day of the conference though, I made sure to compile my notes from each session/talk for the day. I knew that I could write articles doing a recap of the Summit, so that’s what I did. I ended up writing one article for each day of the UXSEA Summit, and posted them on Medium and LinkedIn. My article on UX Collective. I was so pleasantly surprised. Wow, she’s offering me an internship? But before deciding if I wanted to do this, I did my research first about Stampede. I ended up being really impressed looking through their website and social media. Stampede has a long list of clients from all over the world, and they have numerous case studies of their work on their site. They’ve also already been around since 2006, and their team works fully remotely, which impressed me. They also have a blog where they’re so open about their culture and team. I was also impressed reading about Shaza, who is a local leader for the Interaction Design Foundation, and her open posts about Stampede, such as this slideset about how she manages to make remote working great for Stampede. I thought to myself that this is a one-of-a-kind company, and I’d be stupid not to try interning for them. So I decided to message Shaza, telling her how I was really interested to intern for Stampede and sent them my UI/UX portfolio. I also told her though that I could spend only 15 hours a week working remotely for them, since I still would have classes during the internship. Shaza was okay with this and she scheduled a call with me, where Zo-Ee joined, and it ended up becoming an informal job interview. By the end of the call, Shaza and Zo-Ee were willing to hire me, and I was pleasantly surprised. They were so willing to trust me based on my portfolio and articles, and how I answered their questions in an audiocall. I started to see there the generosity of Shaza, and the willingness she had to trust and mentor young designers like me. Within a week, I got sent a paid internship contract, and I accepted and signed it. This was definitely a “Hell Yeah!” opportunity for me. 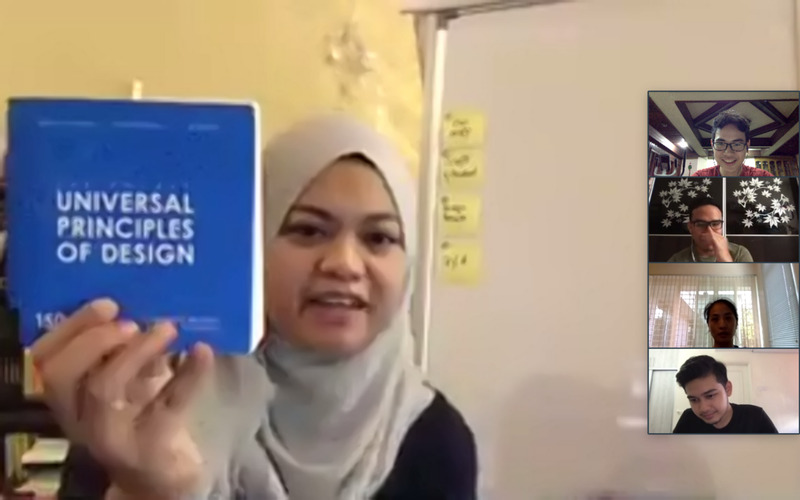 Shaza sharing some books she recently got in our team-wide videocall. Fast forward to today, and it’s only been 4 days, but my internship’s already been great so far. Compared to my previous internships, Stampede actually had a more structured and better onboarding process, even if I was being onboarded remotely. Shaza and I even had a 2-hour videocall where she discussed to me about Stampede’s Why and their core values, and discussed to me about their design process. I’ve already learned a lot from just a few days of talking to my teammates and observing Stampede’s processes as a UX design agency, and I can’t wait to learn more. All in all, I don’t expect this high I’m feeling of being able to intern for Stampede to last the whole way. I’m sure that the work Stampede will give me might be difficult to juggle alongside my schoolwork, since I’m still taking a full load of classes this semester. But I know that if I ever find myself stressed, bored, or not as passionate about working for Stampede, I just have to take a step back and remind myself how grateful I am to have this opportunity. I’m grateful that I got to attend the UXSEA Summit, that I got to meet Zo-Ee and Shaza, that I get to work with and learn from this whole team, and that I get to learn what it’s like to work at a remote company. It’s only been 4 days, but I’m already so thankful to be here. And I hope I’ll continue to be until the end of my internship in April. I’ll likely be writing a couple more articles for Stampede, so if you enjoyed this post, like our Facebook Page or follow us on Medium! My teammates and I have interesting articles and insights to share for you. Until then, keep dreaming and hustling, and I hope this article was insightful or inspiring for you. Brian is a UI/UX Apprentice for Stampede while currently still being a 4th year student in Manila. Brian has had 5 internships already at various tech startups and companies in Manila, and he’s deeply interested in startups and UI/UX design.